The problem of determining the content of nitrogen atoms in the low-pressure glow discharge (GD) plasma in a nitrogen–argon gas mixture has been considered. The balance of the nitrogen atomic concentration includes for the generation of nitrogen atoms in the course of the molecular nitrogen dissociation by the electron impact, the interaction of nitrogen molecules with metastable Ar, and the loss of nitrogen atoms in the diffusion process followed by the heterogeneous recombination at a GD cathode. The influence of the gas mixture composition on the atomic nitrogen generation is determined by numerical calculations, whereas the plasma parameters are found experimentally using the probe method. The electron energy distribution is determined by numerically integrating the Boltzmann equation written in the binomial approximation for a mixture of molecular nitrogen and argon. A.K. Minkevich, Thermochemical Treatment (Mashinostroenie, Moscow, 1968) (in Russian). O.G. Didyk, V.A. Zhovtyanskyi, V.G. Nazarenko, and V.O. Khomych, Ukr. Fiz. Zh. 53, 481 (2008). V.A. Zhovtyansky, Ukr. Fiz. Zh. 53, 488 (2008). T. Kitajima, T. Nakano, and S. Samukawa, Plasma Sources Sci. Technol. 17, 1 (2008). D.I. Slovetskii, Khim. Plazmy No. 1, 156 (1974). V.A. Khomich, A.V. Ryabtsev, E.G. Didyk, V.A. Zhovtyansky, and V.G. Nazarenko, Pis'ma Zh. Tekhn. Fiz. 36, 91 (2010). V.A. Khomich, A.V. Ryabtsev, E.G. Didyk, V.A. Zhovtyansky, and V.G. Nazarenko, Fiz. Khim. Obrab. Mater. No. 2, 44 (2012). V.A. Zhovtyansky and Yu.I. Lelyukh, Ukr. Fiz. Zh. 53, 495 (2008). V.A. Zhovtyansky and Yu.I. Lelyukh, Pis'ma Zh. Tekhn. Fiz. 35, N 15, 81 (2009). V.A. Zhovtyansky, O.V. Anisimova, V.O. Khomych, Yu.I. Lelyukh, V.G. Nazarenko, and Ya.V. Tkachenko, Vopr. At. Nauki Tekhn. No. 1, 92 (2011). V.A. Zhovtyansky, V.G. Nazarenko, V.O. Khomych, A.V. Ryabtsev, O.V. Anisimova, I.O. Nevzglyad, and O.Ya. Shnyt, Vopr. At. Nauki Tekhn. No. 1, 95 (2011). A.A. Kudryavtsev, A.S. Smirnov, and L.D. 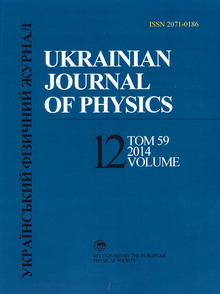 Tsendin, Physics of Glow Discharge (Lan', St.Petersburg, 2010) (in Russian). D.I. Slovetskii, Mechanisms of Chemical Reactions in Nonequilibrium Plasma (Nauka, Moscow, 1980) (in Russian). B.M. Smirnov, Excited Atoms (Energoatomizdat, Moscow, 1982) (in Russian). Principles of Laser Plasma, edited by G. Bekefi (Wiley, New York, 1976). A.A. Radtsig and B.M. Smirnov, Reference Data on Atoms, Molecules, and Ions (Springer, Berlin, 1986). R. Mewe, Brit. J. Appl. Phys. 18, 107 (1967). C. Breton and J.-L. Schwob, C. R. Acad. Sci. Paris 260, 461 (1965). L.M. Biberman, V.S. Vorob'ev, and I.T. Yakubov, Kinetics of Nonequilibrium Low-Temperature Plasmas (Consultants Bureau, New York, 1987). A V. Phelps, J. Phys. Chem. Ref. Data 20, 557 (1991). J.E. Morgan and H.I. Schiff, Can. J. Chem. 42, 2300 (1964). A.V. Yeletskii, L.A. Palkina, and B.M. Smirnov, Transfer Phenomena in Weakly Ionized Plasma (Atomizdat, Moscow, 1975) (in Russian). C.J. Gillant, J. Tennyson, B.M. McLaughlin, P.G. Burke, J. Phys. B 29, 1531 (1996). J.M. Ajello, J. Chem. Phys. 53, 1156 (1970). M. Vicic, G. Poparic, and D.S. Belic, J. Phys. B 29, 1273 (1996). H.C. Straub, P. Renault, B.G. Lindsay, K.A. Smith, and R.F. Stebbings, Phys. Rev. A 54, 2146 (1996). H.F. Winters, J. Chem. Phys. 44, 1472 (1966). L.S. Frost and A.V. Phelps, Phys. Rev. 136, A1538 (1964). A.A. Mityureva and V.V. Smirnov, J. Phys. B 27, 1869 (1994). H.A. Hyman, Phys. Rev. A 20, 855 (1979). O.P. Bochkova, N.V. Tchernysheva, and Yu.A. Tolmachev, Opt. Spektrosk.36, 36 (1974). T.H. Chung, Y.W. Lee, H.M. Joh, and M.A. Song, AIP Advances 1, 032136 (2011).